Cognitive radio is the promising technology for serving the needs of increasing demand for the wireless communications nowadays. Employing cooperative spectrum sensing gives better results as it involves the fusion of sensing reports from more than one secondary user for making the final decision regarding the presence or absence of primary users. Cooperative spectrum sensing is susceptible to security issues such as primary user emulation attack (PUEA) and spectrum sensing data falsification attack (SSDF). 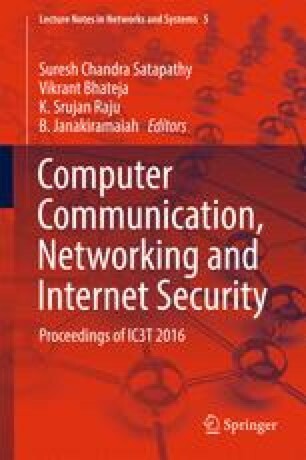 In this chapter we compare the performance of the centralized cooperative cognitive radio network in the presence of SSDF and PUEA attacks by applying three hard decision fusion rules AND, OR and K-out-of-N rules. Simulation results show that the K-out-of-N rule performs well in the presence of PUEA attack and AND rule performs well under SSDF attack. A packet delivery ratio of unity is achieved as the simulation time progresses.